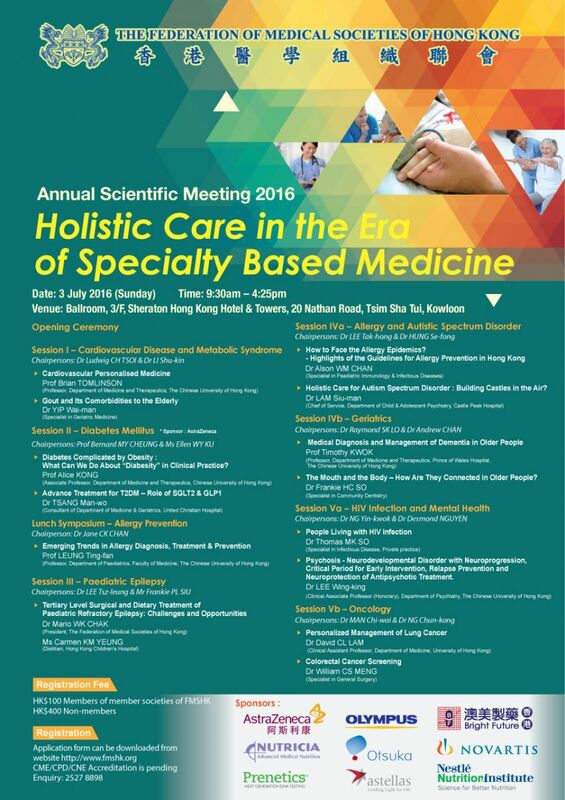 On 3 July 2016, the Federation of Medical Societies of Hong Kong successfully held the Annual Scientific Meeting 2016 at the Sheraton Hotel and Towers, with the theme of “Holistic Care in the Era of Specialty Based Medicine”. A total of 15 medical talks were delivered by a panel of distinguished speakers. They shared with us the latest developments on Holistic Care through a wide range of topics including Cardiovascular Disease, Diabetes, Paediatric Epilepsy, Allergy, Autistic, Geriatrics, as well as Oncology, all of which aimed to enhance the knowledge on treatment or palliation for these advanced conditions. FMSHK was much privileged to have the Officiating Guest, Dr Donald Li, President of Hong Kong Academy of Medicine; and the Honourable Guests, Dr the Hon LEONG Che-hung, GBM, GBS, OBE, JP; Prof the Hon Joseph LEE, PhD, RN, SBS, JP, Legislative Councillor (Health Services); Dr the Hon LEUNG Ka-lau, Legislative Councillor (Medical); Dr Mario CHAK, President of FMSHK and Dr Raymond Lo, Immediate Past President of FMSHK to officiate the opening ceremony. DrDonald LI and Dr Mario CHAK led all the guests to read out the key message - “To achieve disciplinary, integrative & personalized medicine, providing full physical and psychosocial support!” to signify the opening of the Annual Scientific Meeting 2016. We would like to take this opportunity to express our sincere gratitude to our Officiating Guest, Honourable Guests, Co-chairmen, Chairpersons and Speakers for their contributions that made the event a great success. Our gratitude also extends to various sponsors for their generous support. We look forward to seeing you in our Annual Scientific Meeting in 2017!